We ensure advanced and optimum support for Electric Water Heater Repairing Services. These technical support are provided under the supervision of technical experts. Our well trained executives provide reliable and advanced services with complete quality assurance. These maintenance works are provided within the stipulated timing at profitable market prices. We have carved a niche amongst the most dominant names in this domain, instrumental in providing an excellent quality range of Water Heater Maintenance Service. We hold expertise in this business and are instrumental in providing Water Heater Maintenance Service to our customers. This Water Heater Maintenance Service is rendered by our highly experienced professionals utilizing latest tools and technologies. Furthermore, we are execute these services in assured time frame. 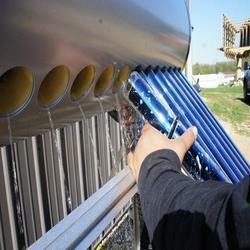 With the aid of knowledgeable team, we are betrothed in rendering Solar Water Heating System Maintenance Service. These services are extremely admired among our customers for their timely completion. Our offered service is accomplished using the advanced techniques. Furthermore, these services are rendered at reasonable prices. C. S. Salve Enterprises is the leading provider of Water Heater of major brands. We offer servicing, maintenance and repair facilities for all types of residential and commercial works. Are you considering your options for water heater repair service. Then, you want to enlist the help of skilled professionals that you can trust. At Geyser, our technicians is able to diagnose and fix a diverse range of appliance malfunctions, preventing you from having to replace the item in the near future. We are an eden service point, reliable air conditioning/heating company that specializes in water heater service and repair and installation. -Water Heater Repair & Service : Crompton Greaves Water Heater, Racold Water Heater, Bajaj Water Heater, Khaitan Water Heater, Remson Water Heater, Indo Water Heater, AO-Smith Water Heater, Usha Lexus Water Heater, Venus Water Heater, Havells Water Heater Repair Services in Panchkula. We provide Water Heater Repair Services in Kanpur . Our technicians are experienced enough to handle all brands and models of water heaters such as Racold, Venus, etc. along with all model of geysers water heater. So, if you need any assistance in your water heater repair, feel free to contact us. We offer a wide range of Cartridge Heater Repair Services. These Cartridge Heater Repair Services are offered at highly affordable prices.